Opulent events deserve a space that is no less than spectacular. What better than a terrace banquet hall to take your celebrations a notch higher? With an open sky gracing your occasion and fresh air giving your guests a fresh break from closed and packed event halls, terrace banquets are a perfect choice for modern couples looking for something new and interesting for their wedding celebrations. When it's Bangalore, all the better, right? Why be indoors when you can enjoy the lovely outdoor weather Bangalore has to offer. Whether it is a sangeet, a pool party mehndi or haldi, cocktails or intimate wedding reception you want to host, Bangalore has some stunning terrace banquet halls to offer, each with varying capacity and interiors designed with modern flare to suit your contemporary wedding needs. These terrace banquet halls come with wedding specialists who ensure your wedding experience is a tranquil one where you, your family and guests enjoy the festivities to the fullest without any hiccups. Scroll on to find your match. Fortune Park JP Celestial is a gorgeous venue to host your weding festivities with bright lighting that illuminates the whole terrace banquet hall this Bangalore wedding hotel has to offer. The venue also features grand banquet halls that are sumptuous and perfect for lavish wedding receptions or pre-wedding functions like a classic cocktail party or an energetic sangeet. If you're looking to host your Big Fat Indian Wedding with class and style, Fortune Park JP Celestial is the place you've been looking for! If you’re looking for aesthetically decorated terrace banquet halls in Bangalore, look no further than Octave Hotel & Spa. Offering stylishly designed banqueting spaces; this wedding hotel in Bangalore provides small as well as medium-size capacity areas to host your pre-wedding and wedding functions. You can either avail their in-house catering services or make your own arrangements. The venue also allows outside decorator, DJ and liquor on the premises. Country Inn & Suites- by Carlson, Bangalore is a known name in the hospitality sector. The venue has a sumptuous party hall that is ideal for hosting medium-sized wedding functions whereas there is also a terrace pool which has a large seating capacity best suited to host various wedding ceremonies and parties. If you plan on hosting your wedding at Country Inn & Suites, then be rest assured that your wedding day menu will be designed by the best culinary chefs of the country. To make your wedding day a bigger celebration, the venue allows you to get your choice of a decor team and a DJ who make this special day a memorable one. This luxurious wedding hotel in Bangalore offers the most extravagant banquet halls in Sarjapur Road. Right from their exterior to interior infrastructure your guests are sure to be spellbound. Their banquet hall offers a great space to host intimate to medium-sized functions, while their terrace banquet hall is great to host pre-wedding functions, such as mehndi and sangeet under a starry sky. As a full-service wedding hotel, Berry’s offers all wedding services, including catering, decoration and alcohol facilities in-house. The venue allows you to book your own DJ. The Grand Magrath Hotel is one of the finest wedding hotels in Bangalore. The venue offers three beautiful banqueting spaces for themed weddings. You can choose either of their banquet halls for a medium-sized gathering or their terrace poolside venue offering a scenic view for an intimate outdoor celebration. The Grand Magrath Hotel has its in-house team of skilful caterers to look after your culinary delights. For other wedding related services, like decoration, entertainment and alcohol you can make your own arrangements as the venue permits outside vendors. This is not all. 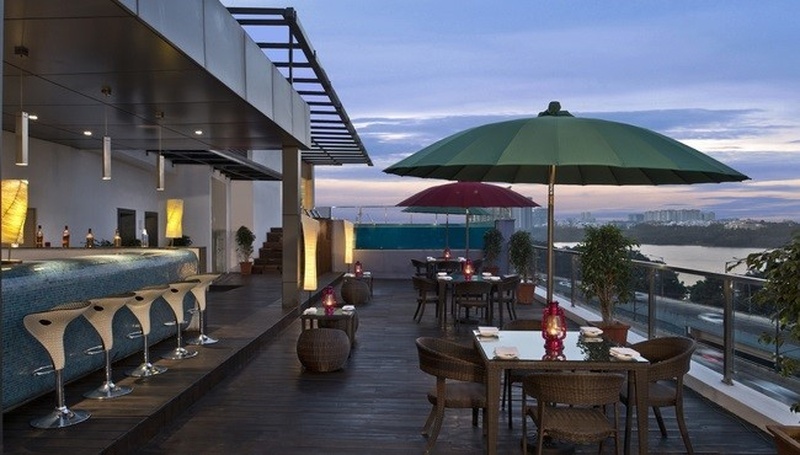 We have many more terrace banquets in Bangalore you can check out that will fit your needs and budget here.